I have been a fan of the Toot and Puddle series by Holly Hobbie since I discovered it ten years ago. So when I learned that she had a new book out about a little girl and her doll, and I got very excited and requested that the local library order copies. Apparently, I wasn't the only person who made the request, because it took several months for our turn with the book to come and we just got it at the end of July. Abigail has loved it as much as I thought she would, and enjoys looking through the pages for the hidden Puddles. In the story, Fanny asks her mother for a new doll just like the other girls have. Her mother refuses though, saying that she doesn't like the way the doll looks (the appearance is similar to a Bratz doll, so I can't say that I blame the mom). 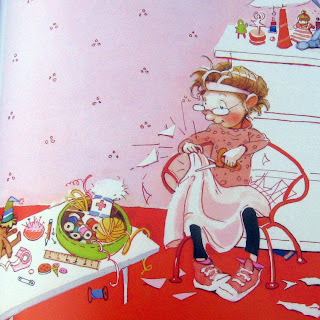 Fanny decides that she will make her own doll, and gets her scissors and cuts up a pink pajama top (see photo above). As I was reading this out loud (and I did read it ahead of time, but it didn't occur to me until later), I wondered if this was the best message for my two year old. But I keep my sewing supplies put away, so it shouldn't be a problem, right? This is the doll that Fanny makes for herself. Isn't it cute? Fanny experiences some peer pressure to play with the Bratz-like doll instead of the one she made for herself, but she comes to realize that she got more out of the experience by making her doll. I love the message of the story. After we finished reading the book, I left the room to check on the laundry or something, and came back within minutes. We just happened to have read the book in the same room where I keep my sewing machine. As I walked in the door, I saw Abigail sitting at my machine, with scissors in hand (how did she reach those? ), cutting up one of the headscarves I'd made from the pattern in Weekend Sewing. "Abigail, what are you doing?" I told her that I would be glad to do that for her. I involved her in the process of picking out the fabric for the body, and the fibers for the hair and face. She also helped with the stuffing (NOT the cutting). It took on hour that day to put the doll together, including hand sewing the head closed after I stuffed it. As soon as I finished that, she grabbed it and took off and I didn't get to finish the rest until the next day. 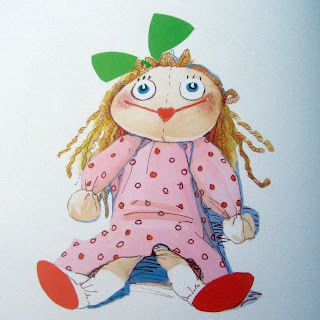 The pattern came from the book Rag Dolls and How to Make Them edited by Dorothea Hall, which is out-of-print but may be available at Amazon (or check thrift shops or your local used book seller). I traced the pattern out a year ago before I returned the book to the library. I think it also contains patterns for the clothes, but I'm waiting until the library is sorted out before I search for the book again. I may start drafting my own doll patterns, though. This was fun! I used polyfil stuffing for the insides. I grew up using this stuff and had no issues with it before, but I don't like the pilling that happens with it. I haven't used wool before, but I'm considering buying some soon. The body is a linen-cotton blend I got at JoAnns. 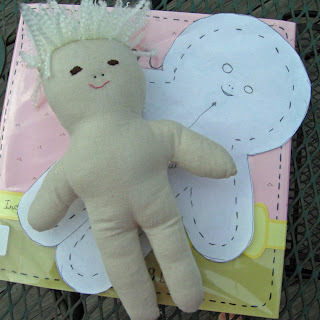 I would normally use muslin, but I couldn't find it and I liked the idea of a linen doll. Like Fanny, I like the feeling I get from making my own doll. I hope that Abigail appreciates the handmade dolls as much as I did as a child. PS. 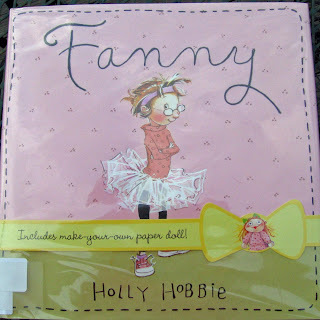 Holly Hobbie has another Fanny book coming out on September 1 - Fanny and Annabelle. 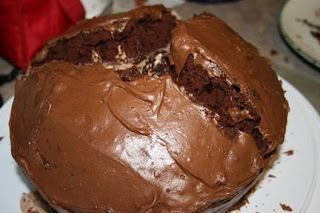 I used the Hershey's "Perfectly Chocolate" Chocolate Cake recipe (it's usually on the back of the Hershey's cocoa can). 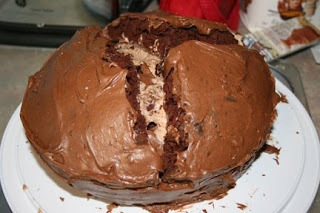 I think the frosting was the "perfectly chocolate" frosting, too. 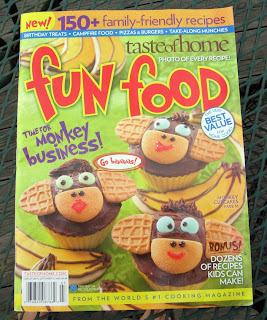 Although I might have used the One-Bowl Buttercream Frosting from Hershey's Best Loved Recipes. For the mint filling in the middle, I made up a recipe. It's not exactly what I wanted, but it was good. I used 8 ounces of cream cheese, powdered sugar, cocoa, peppermint extract, and milk. 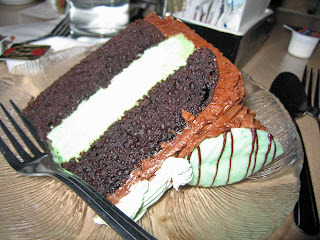 If anyone has any ideas on how to make a creme de methe filling for a 3 layer cake, please let me know. I'm not sure why it cracked down the center. I've been baking since I was eight or nine, and I've only had a few cakes do this. It didn't change the flavor, and it was an interesting look. I think next year I might finally try to make the Italian Cream Cake - it's a favorite at our house and since our birthdays are a week apart, it's a good idea to have only one cake for both of us. Abigail and I won this wonderful book a few weeks ago in a giveaway at the blog What Do We Do All Day? by Mom and Kiddo. Mom lives in Brooklyn and frequently features urban picture books that are set in places her children are familiar with (or that look familiar to her children). We live in a fairly rural setting, and I grew up in a very rural setting, so the books about city living are an education for us. We were so excited to find it sitting on our front porch one day when we walked out to check the mail. 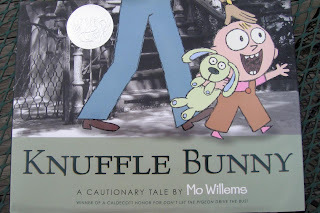 In Knuffle Bunny, the main character, a toddler, goes on an errand with her Daddy and along the way loses her favorite friend. Abigail could relate to having Daddy-time, not being understood by adults, and the expressions on the little girl's face. We're so grateful to Mom and Kiddo for sending us this book! We will treasure it. We're also fans of Mo Willems Pigeon series, especially The Pigeon Finds a Hot Dog! I let Abigail check one book out of the library last week (since the librarians will have to enter everything manually for a while I didn't want to cause too much work for them), and we chose There's A Hole In the Bucket with pictures by Nadine Bernard Westcott. This book is now out of print, unfortunately, because it's wonderful! I've loved the song since I was a little kid and saw a skit on Sesame Street, and I couldn't just read the story to her. I had to sing it with the strong twang that I remember. 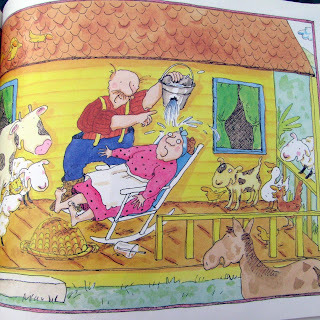 The illustrations in this edition are wonderful, with animals following Henry all over the farm to watch his antics, and Henry's revenge on Liza at the end is priceless (hopefully you'll be able to find a copy, but if not - he dumps the final bucket of water on her head). I've also discovered that you can get vintage Sesame Street on dvd (thanks, Holly!) Old School volume 1 (1969-1974) and Old School Volume 2 (1974-1979) are both available on amazon (and anywhere dvds are sold, I'm assuming). What was your favorite Sesame Street skit when you were a kid? Just a few of the things I've enjoyed reading lately and wanted to share. I'll Make This Quick @ Write.Click.Scrapbook - Rebecca Cooper is the guest blogger and she writes four tips on getting pages, journaling and photography done. Also a mini lesson on photographing your layouts if you don't have a scanner. Books About Colors @angry chicken - All about making color books for your kids using paint chips from the hardware store. I think my interpretation of this project will be different than hers, but it sounds like she got a different interpretation from each child, anyway. Tuesday Tutorial: Jen Lee Tell The Whole Story @Ali Edwards - a great article on journaling and getting the whole story down. Diapers For the Doll @The Artful Parent - I tried making a doll diaper last fall and didn't do a very good job. Seeing how well hers turned out makes me want to revisit the tutorial now that I'm more familiar with my sewing machine. 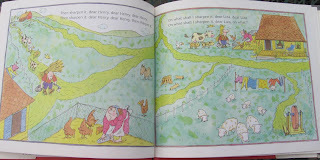 The Road To Miss Rumphius' House @Sharon Lovejoy Writes. . . - When I was in high school, I had the opportunity to "teach" a reading class of third graders for several weeks. 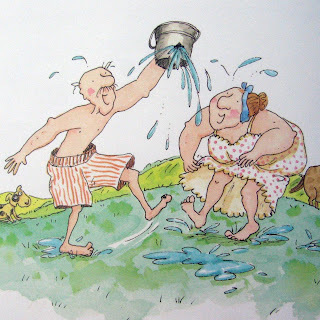 One of the stories we read was Miss Rumphius and the book has had a soft spot in my heart ever since. Not to mention that I love Sharon Lovejoy's books on gardening with your children. I've always wanted to be like Miss Rumphius, but will take Ms. Lovejoy's advice and use native wildflowers. Fizzy Bath Bomb Cupcakes @Make & Takes - What I like about this post is that it's a science experiment and a craft project, and you can do it with things you buy yourself instead of buying one of those beauty supply kits in the kid's section at the toy story (the ones that keep getting recalled?). I think it's so much cooler to show your kids that you can find the materials anywhere and you don't have to buy a kit to make the craft. I also don't get the Magic Cookie bar kits either since all the ingredients are right there on the shelf next to the kit box. Artwork in Your Home: the How, the Where , the What @Simple Mom - Guest blogger Heidi talks about how to group your art and how to make it more meaningful (example - create it yourself, no matter how simple, instead of hanging something mass-produced). 14 Books to Help Ease Through Transitions @Simple Mom - A helpful list of books to read to children through all kinds of transitions from a new baby to starting to school to losing a loved one. A Bridal Shower Gift @playful.productive.present - A cool idea for any shower really - I can see using this idea at a baby shower to give moms helpful advice or ideas for playtime activities. If You Can Remember @beauty that moves - I'm thinking of printing this poem out and hanging it where I can see it on a daily basis. I especially like the parts about understanding your child's maturity level and letting them gain indepence instead of forcing it on them (or keeping them from it). Beach Blanket from Handmade Home @Sew Liberated - I can't wait to make this blanket! Maybe I'll have time in September. In the meantime, I'll drool over all the versions I see in blogland. My husband is a fan of recipezaar.com. 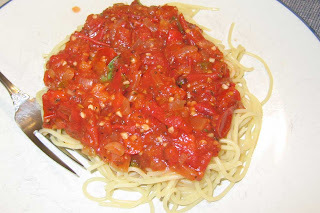 He's found several recipes that have become family favorites. The recipe we perhaps use the most is this no-rise pizza crust. We eat homemade pizza about every other week, so I'd say this recipe is by far our most used one from recipezaar. 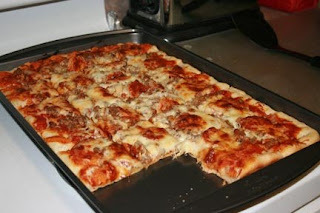 We have other crust recipes we like, but if we decide at the last minute that we want homemade pizza, this one can get us pizza fairly quickly (we don't keep premade or mix crusts on hand). For toppings, we usually have pepperoni, and we freeze sausage in small quantities for pizza and spaghetti.We're also open to making barbeque chicken pizza, taco pizza (we also freeze leftover taco meat), or whatever strikes our fancy. 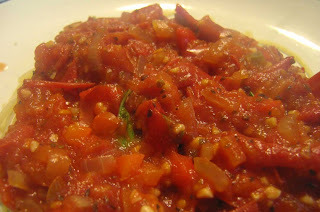 We do try to keep some kind of sauce in our cabinet or fridge so we always have some pizza makings on hand. This pizza takes maybe 20 minutes to make (not counting baking time), and 10 minutes of that is letting the dough rest while you gather your pizza toppings. And you get a real pizza with homemade flavor and none of the fillers or preservatives in premade crusts. Yum. 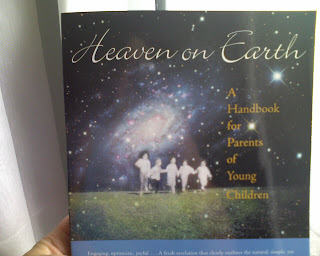 On Saturday, I picked up my copy of Heaven on Earth: A Handbook of Young Children by Sharifa Oppenheimer. This is the book I mentioned a few posts ago that was highlighted on the Sew Liberated blog. So far I'm really enjoying it and I'm glad I made the decision to get it. Here is an experiment you can try, if you like; it is something you can do, to "lock in" your own learning process. Make your learning "interactive" by investing in a blank book, a journal. Get something as simple as a spiral notebook, or a beautiful hardbound one, if you prefer. Divide it into nine sections, to correlate to the nine chapters in the book. This idea is right up my alley. I loved the classes in college where I was required to keep a journal documenting the learning process and my thoughts on the material we were covering. Those journals are very interesting to look back on! For this book, she suggests that you make notes on how you're implementing what you're learning. Or drawing pictures of your daily schedule or your ideal playroom or your ideal outdoor play space. There's a chapter on festivals (or holidays) and she suggests writing down the recipes that work well for the festivals you choose to celebrate. The idea is that over time this will become a family heirloom record of your parenting journey. I'm currently looking for a journal to use for this project. I think it would be best to be unlined since lines distract me when I'm drawing. I'd like a thick paper so I can use my favorite archival pens, which bleed through thinner paper. I'd actually like the kind of paper that has lines on one side and is unlined on the other. I like the idea of a hardbound book. I have a beautiful one that is unlined and has minimal watercolor illustrations and is called A Woman's Journal. Only I'd like it to say A Mother's Journal. I'm considering getting a spiral bound sketchbook, but I'm a little concerned about the inability to add pages over time (actually, that's a concern with a hardcover journal, too). My thought, though, is that I can eventually take the pages out of a sketchbook and put them in page protectors in a scrapbook. That's only if I can find an 8 1/2 x 11 sketchbook or smaller, though. So far, I've only found 9x12 sketchbooks. So, if anyone has any suggestions for a journal, please put it in the comments. Feel free to say "get over it and do it already" because I've been thinking that too. 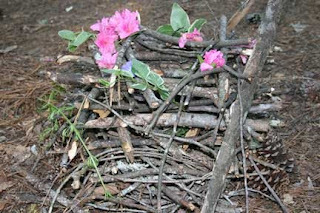 This is a fairy house that my 3 year old niece Laurie and I built in April while my mom and my daughter were napping. Actually, I did a lot of a building after the first few rows because apparently there were elephants or giraffes lurking in the woods, and Laurie needed to hunt to for them. Or maybe they were tigers? Anyway, I was so excited to build this because (as I may have mentioned before) we don't have trees at our house and my parents live in a small forest. You don't know what you'll miss. . .we do not have pine cones, sticks, pine needles, dead leaves, or any natural debris of any kind at our house. Some of you may be thinking "Wow, clean up must be a breeze!" I suppose this is the case, but then how do you build fairy houses I ask? Really, does anyone have any ideas? I'm almost ready to resort to asking for storm debris on the side of the road (go ahead, call me weird). I have a few (too many) blogs that I enjoy reading, and keep finding new ones all the time. Today I'm sharing a few of my favorites posts from the past week or so. Enjoy! Pop Science @What Do We Do All Day - Discusses popping amaranth grain like popcorn. What a neat idea! We're huge popcorn fans, and enjoying finding new things to pop. bulk food bags @beauty that moves - I've been wondering about bulk food bags and how they work. These are really pretty. This is a new blog for me. I discovered her this week because she conducted an interview with Amanda Soule of SouleMama. Me: The Abridged Version and Giveaway @The Art of Choosing Joy - Kolette Hall talks about Cathy Zielske's project based on the book The Encyclopedia of an Odinary Life. I've done a similar project and really enjoyed it. Cathy used to teach her album project at CKU (Creating Keepsakes University) and will be teaching it this fall in an online format through Big Picture Scrapbooking. Ditchin' Lunchbox Dread @The Breeder Files - A take on menu rotation (Monday is past day, Friday is pizza day, ect). Breeder Mama has chosen theme days for her child's lunches, for example Monday is Peanut Butter Day and there is so much more variety in that than I had thought possible. I don't have to worry about school lunches for a while, but it's such a cool idea that I thought I'd share. Welcome to August @Write.Click.Scrapbook - Lots of ideas for scrapbooking summer - journaling questions, quotes, photos tips, mini album ideas and more. Handmade Home: Projects, a Giveaway and More @beauty that moves - Unforunately, the giveway is over now. I like her family's interpretations of the projects from Handmade Home. Also, the question she asks for the giveaway (what's your favorite spot in your home?) is a great journaling/scrapbooking jumping off point. I think I'll do a page about my answer. Star Wars Felt Finger Puppets @Make & Takes - I love these puppets. Felt is very popular in our family (it's a favorite gift for my niece and nephew. I fully expect my nephew to make some of these finger puppets when he sees these pictures. Do you have enough felt, buddy? Signs and Magic @A Mountain Mama - This essay made me take a deep breath and breathe. It is so easy to get caught up in expectations of ourselves and others expectations of us. I love how she laughed when she caught her daughter making a mess. And then didn't beat herself up about it. Composting Fun @What Do We Do All Day? - This post made me laugh. And then think maybe I should try another worm farm. My daughter could tear their bedding to my heart's content. Summer Boredom Busters @TipJunkie - It may be cheating to list someone else's link post in my link post, but these are some great ideas. It's too late for most moms, since school has started in most places, but maybe it can help the moms of non-school age children. And make sure to bookmark these ideas for next summer! Free Printable Lunchbox Notes @Skip to My Lou - My Mama used to write notes on our lunchbags or our napkins. I wish I'd kept some of those. So I love the idea of slipping notes into your child's lunchbox for encouragement or connection. Here's another way to do that. 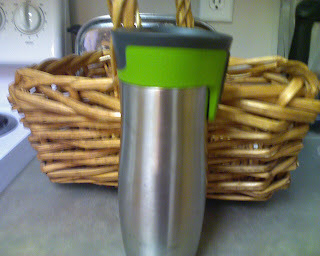 My new Contigo mug - I broke the last of my plastic water bottles last month. I wanted an aluminum water bottle but I couldn't find one that was insulated. My husband suggested looking at Costco for a Contigo mug (he uses his all the time for coffee) even though we hadn't seen them in months. I was so excited to find them in stock last week when we went. My favorite part? The olive green lid. Green - any shade - is my favorite color. I also like that it doesn't leak when it tips and that it's unlikely to crack across the bottom if I drop it at the zoo like my plastic one did last month. 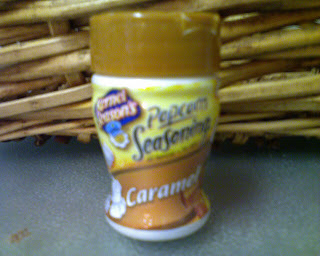 Kernal Season's Popcorn Seasoning in Caramel - I have been searching for this far longer than I am willing to admit (especially since it is easy to order online) but we finally found a small container a week ago at the Family Video Store (the one with free kid rentals - love that!). One week later and there may be enough for one more bowl of popcorn. I really need to get some more. Ginger beer - Jamaican is my favorite brand and I can only find it at a small Asian grocery next to our favorite Chinese take out place. 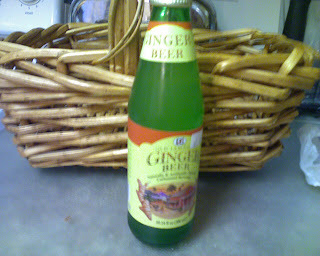 It's got a very strong ginger flavor - much stronger than ginger ale and even stronger than most other ginger beers I've tried. The only problem is that since I don't get it very often I tend hold onto it longer than necessary rather than drinking it and going to get more. I'd like to look into making it myself some time. Please forgive the shoddy nature of the photos. I took these with my cell phone. I'm testing different ways to add photos to this blog. I know it's nice to see pictures on a blog but it feels like a tedious process to me. This way was easier, but these photos are really bad. At least I'm working on it though! Another thing - that basket in all the photos. Can't remember where I got it but I absolutely love it and wish I could find another. Although it might not be as special then. On Sunday it looked fabulous holding a tea towel and a batch of pretzel rolls. Then again, what wouldn't? I'm so excited about the new SouleMama book, Handmade Home, that I am beside myself. As a celebration of the impending release (Tuesday, August 11) I thought I would share some of my favorite projects that I've seen on SouleMama over the years. Actually, I just started reading her blog a little over a year ago, but I'm such a nerd that I went back and read all of her archives. I would happily buy a compilation of her posts - anyone else? Comfort Clothes on July 23, 2007 - I just fell in love with the skirts and am hoping that I will soon be confident enough to make my own. It also makes me wish I still had a couple of the skirts that I used to love so much so I could copy the pattern. Picnic Time on May 1, 2007 - I love the picnic blankets, the napkins, the basket, the photos. I really want to make a blanket like this with the rock pockets and load a bunch of stuff into that basket and head to Stone Mountain. Nevermind that it's eight hours away. In anticipation of the birds on March 7, 2007 - I can't stop thinking about these linen aprons. I like the pleating at the top for the mama aprons. I love that they're 100% linen. I'm crazy about the pockets (I love pockets and so does Abigail). And the neckties (instead of straps) satisfy my safety first concerns with a toddler. a shop update! on September 25, 2007 - While this is "just" a shop update, there are great photos of two projects I've been considering since I saw them - corduroy smocks and a linen lap quilt. Oh, I love linen. Feeling Thrifty on August 18, 2005 - She describes making cloth diapers, burp cloths and cloth feminine napkins. I've been toying with the idea of all three and I like her designs. Acorns Are Fun on November 13, 2007 - This post reminded me of the natural materials I used as toys when I was a kid - leaves, sticks, rocks, pine cones etc. I'm hoping to order some acorns this fall and go in search of the real thing. Keep Drawing on May 6, 2009 - Encouragement for creating/crafting/making where your children can see you or, better yet, with your children. It's all about modeling. Making Books on November 16, 2007 - My nephew started writing books for us when he was about three years old. This post has some wonderful ideas on creating handmade books for little ones to use. I should probably get to work on making some for my own little munchkin. For Handkerchiefs on August 3, 2009 - A cute bag to store handkerchiefs. It reminds me of a pocket Kleenex holder, only much larger. I'm considering switching at least some of my household to cloth over paper, and this would be a great place to store them. a Good Folks throw on April 14, 2009 - I love the colors in this throw, but I'm also interested in the organic cotton fabric she uses as the backing. As you can see, I look for inspiration from SouleMama quite a bit. I hope you enjoy these posts as much as I do. I'm going to go reread The Creative Family and wait for my copy of Handmade Home. the cover story and beach blanket to-go @ SouleMama - SouleMama's new book Handmade Home will be released Tuesday, August 11 and she is having a celebration on her blog with features from the book. I can't wait to get this book so I can make the beach blanket! Your 12 Stories @ Ali Edwards - not exactly a new post, but one I'm still thinking about - if you could only tell 12 stories from your life, what would they be? A friend from college emailed me and asked if I could provide some suggestions on scrapbooking for her Mom's group's presentation on archiving and recording memories. She called me the scrapbook queen. Bless her heart. She made my day. Of course, she hasn't seen any of my scrapbooks, but at least she saw me as a resource! I thought I'd share here what I told her. It occurred to me that it's been far too long since I discussed scrapbooking on this blog! As way of explaining myself, I've been scrapbooking since January 2000. Before that, I was the assistant archivist at my city's historical society for two years (give or take). I was a history major in college and a "journalist" in high school. I've been keeping journals/diaries since I was eight years old and got my first camera when I was nine. So I've been doing record-keeping, memory keeping, sorting, and documenting my whole life. This is what I love. The Big Picture by Stacy Julian - This book is not so much a how, but a why of scrapbooking/record keeping. This book changed the way I think about scrapbooking and helped me to think about it more as the story of my family, and not a collection of events that need to be scrapbooked. Photo Freedom by Stacy Julian - How to organize your photos and memories in a way that will be accessible to you. It's sort of the Library of Memories class in book form (although the class is worth every penny). Life Artist by Ali Edwards - Ideas for preserving memories. Ali considers herself (and anyone else who does this) a life artist for preserving her memories in an artful way. This does have to just mean scrapbooking. There are cool ideas for home decor in this book too. Ali seems to be a cool person in general. Is it too weird to say I wish I knew her in real life? The Book of Me by Angie Pederson (and Growing Up Me which is about kids) - Ideas and prompts for journaling and scrapbooking our own memories - the only ones we're truly qualified to tell. Big Picture Scrapbooking - Online scrapbooking classes for any skill or level. Some are project based, some are technique based. There are journaling classes, home decor projects, all kinds of things. New classes are added all the time. I can't say enough about how much I love taking these classes! I'm also working on a list of scrapbooking/memory keeping tips. I will post them soon. I posted several months ago that I had switched from comment verification (having commenters fill out some nonsense word to prove they're not spammers) to comment moderation (I approve comments prior to publication). I've had some comments recently that were questionable, and I've decided to start using comment verification again. I hope this doesn't cause any problems for anyone. I just want to ensure that the comments I receive on my blog are legitimate. I'm a big fan of Facebook memes, and consider them to be great scrapbooking fodder. (I actually have printed the 25 Things meme from several friends, added a photo and placed it in the Friends section of our People We Love section of our Library of Memories.) I recently saw one asking for a list of 15 books that will always stick with you. You're supposed to make the list in 15 minutes. This was harder than I thought because I had to narrow my favorites down! After rereading the list, I'm disappointed to note that I forgot to include Silas House anywhere on my list. I'm sure I'll notice that I'm missing more books over time. I read most of the books in high school, or college, or even earlier. I felt that if they were supposed to "stick" with me, then they needed to have passed a test of time. What's YOUR list of 15? Have you read and enjoyed any of my favorites?